XLT model. 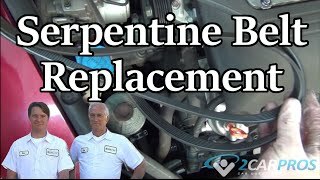 How do I put the serpentine belt back together after installing a new alternator, and removing the tension-er? Serpentine belt routing diagram? As there is no picture and harmonic balancer fell off. What size engine? With or without A/C? So I am having some trouble getting my serpentine belt on. I have the right diagram and set the belt up as it is supposed to, then when I pulled the tension-er as far as I could there was not enough slack to put the belt on. So I am stuck I have been racking my brain for the last few hours and need some help. Is there anyway to adjust that even more? As a side note I did double check that I belt and diagram I have are for my truck. Do you still have the old belt? If so, stretch the new belt next to the old belt, and verify the new one is the same length. If your belt routing is correct, that means one thing. The new belt is too short. Thanks for the reply, I did have the old belt and its the same size and the diagram that I used is for the 2wd 3.0 Escapes. I went back and tried to see if there were any other sizes but that was the only size they had for my truck. I spoke to the tech there and they told me that I was able to adjust the AC compressor pulley (BTW had the compressor unit pulled its just a pulley there now) to help it fit, is this possible? You only have an auto tension-er, that is what your pulling back. Nothing else is adjustable. You should have a smooth idler pulley. I find once the belt is in all the grooves of the pulleys, it slides right over the smooth idler pretty easily. Have you tried this? I just replaced the alternator on my vehicle and I cannot for the life of me get the belt back on. Can you help? See picture. The one pulley needs to be move clock wise to get belt on it will say removal in picture but same to reinstall. Need To Bypass Air Conditioner. 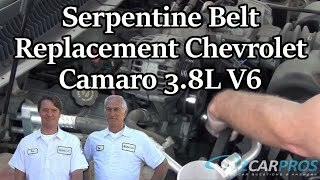 Need To Know Serpentine Belt Size. 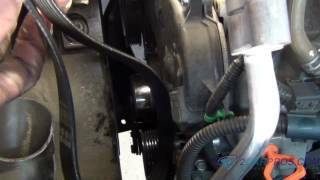 I Need A Belt Diagram For 2003 Ford Escape V6 There Isn't One Under The Hood?